Today I'm happy to announce Digital Downloads on EarthPhotos.com. Just about all of the 18,691 photos on EarthPhotos may now be downloaded immediately. Two sizes are on offer. You can buy a Web Size image, roughly 640x480 pixels in size, or 0.3 megapixels. This is suitable for web sharing on social sites like Facebook. Or you can buy a 1Mpix image, roughly 1 megapixel in size. These photos are for your personal, and not commercial use (Read Personal License). The 1 Mpix download is roughly 816x1224 pixels, about big enough to print an 8x12. And we want to help with your commercial application. We're proud of our lion photo in Afar Magazine. It remains the Most Popular Photo on EarthPhotos.com, as voted by users. A couple of weeks back, we placed a photo on a kids' show for German TV. All these commercial applications are different, so please talk with us about what you need. I think they’re both right. You just pick a spot and go. I like Hipmunk for initial checks of air routes, because it's quick, streamlined and easy. (For air route junkies, there's also AirlineRoute.net.) For example, you don't have to click a button to tell Hipmunk if your flight is one way or round trip. If you don't enter a return date, it figures it out. Smart. Here's my review. If you search for "(your destination) airport," there's usually a Wikipedia result that will tell you the flights to and from a place. Here's an example of what you can learn from Wikipedia about who flies where from Ashgabat airport. TripAdvisor. It makes me crazy that they try to keep you on their site and don't link to the hotels they describe. That's nuts. But they've got reviews of hotels in some pretty obscure places. And check the travel planning resources in the sidebar here on CS&W. It's time I mentioned the Practical Travel Gear blog. As somebody whose carry-on bags are 1. a small camera bag (with a camera body, three lenses, camera batteries, memory cards and a cable release) and then 2. A bag of stuff to support bag#1, I'm a recovering gadget fan. There was a time when every trip was an excuse for a new piece of camera gear. Nowadays it's different. After each trip I sit down on the floor and take every last item out of those two bags, and anything I didn't use goes back in the camera room under the stairs, banished from the next trip. But still, you never know when you'll find that must-have essential gadget, and Practical Travel Gear's fun. I've listed it over in the "Worth Your Time" list in the next column. Jeff Bartlett's got a nice niche. His blog promises camping cooking made easy. He says his recipes teach travelers how to cook nutritious meals on a single-burner camp stove. Does camping cooking gear reviews, too. Check it out at The Camping Cook. I'm putting it in CS&W's "Worth Your Time" links. Very nice of the folks at U.K.-based IGLU Cruise to choose Common Sense and Whiskey in their IGLU Cruise Website Awards, as one of nine "Best Travel Information Websites," right up there beside Lonely Planet. "truly excellent information sites to help you both in the planning stages of your travel and whilst on the road. We are sure you’ll agree that the efforts of the writers and webmasters behind the following award-winning sites are amongst the best out there, combining highly useful content with superb presentation." Nice new tool today thanks to Personal FX - a handy currency conversion tool right here at the top of CS&W. Close enough to the same that I'm wondering why I spent multiple hours on a gorgeous morning painstakingly clerking in every trip all the way back to my first drive to Canada in 1980 (Or maybe it was 1979). 105 countries visited, ranking 109th overall. Our most-visited countries are the predictable European ones, and many are because they were transit stops on the way elsewhere. The top ten: Germany 11 visits, Finland 9, Austria & France 8, Thailand 7, Italy, Russia, Switzerland & the UK 6, and China 5. The trouble is the arbitrary rules. Just added a new selection to the Worth Your Time sidebar, below Travel Tools over there on the right. Check out Green Traveler Guides. Drop by a new blog by Molly Ottersen and Virginia Saunders called Trip Planning Guide. I've listed it in Travel Tools, at right. What Time Is It? Where? In general, Europe goes off their Summer Time this coming weekend, a week ahead of the end of Daylight Saving Time in the U.S. On the U.S. East coast, we’ll move from GMT minus four hours to GMT minus five hours at 2:00 a.m. on 1 November, but the Europeans, over their various time zones, will have fallen back an hour a week earlier. Which means that every timetable for every airline flight between the two continents has to be rewritten twice, not just to account for the time changes, but an additional time to account for the one week in between. Here’s a list of Daylight Saving Time Around the World 2009. Photo from a hotel check-in desk in Lhasa, Tibet from EarthPhotos.com. Just a note that, in addition to the Common Sense and Whiskey RSS Feed link at the top of this blog, I've added a new link to the AlphaInventions.com Travel RSS Feed in the Travel Tools list here on CS&W. You might take it out for a spin and see if you like the content they aggregate from like-minded blogs. Around here, most brainstorming starts with a look at the airline route maps to see who flies where we're thinking about going. Maybe you can devise an interesting way to get there you'd never thought of. This worked great when we needed transportation between Finland and Rwanda. A look around showed Ethiopian Airlines would pick us up in nearby Stockholm and deliver us to Kampala, Uganda. We got an overnight trip on the Silja Line's "party boat" between Helsinki and Stockholm and a lovely day in Stockholm as an unexpected part of the itinerary. The airline route updates blog has proved useful, too. Just recently, thanks to them, we found a new South Africa to Walvis Bay nonstop. We need to be in Walvis Bay around New Year's Eve, and that opens up the possibility of just popping into Namibia at the last minute, instead of waiting around a day in Windhoek - which is perfectly nice, don't get me wrong, but we were there year before last. More tools soon. Next time we'll look at international ferries. See photos in the Finland, Sweden, Uganda, Rwanda and Namibia galleries at EarthPhotos.com. Climb an active volcano? Chase a cyclone? Photograph the northern lights? All you need to pick your destination is right here. The Alaska Climate Research Center (webcam here - expect dark) of the Geophysics Institute at the University of Alaska Fairbanks offers a handy resource for this time of year, an aurora forecast customizable for where you live (or plan to visit). (Photo at right from the aurora forecaster). While we're in the sky, try Space Weather, Earth & Sky Tonight and a page of several sets of data, like eclipses and transits of Venus and Mercury, from the U.S. Navy. Not a forecast, exactly, but the U.S.G.S. keeps an extensive list of the latest earthquakes in the world. The Institute for Astronomy at the University of Hawaii keeps track of tropical cyclones, hurricanes and typhoons at Tropical Storms Worldwide. The University of Wisconsin - Madison keeps track of the world's most active volcanoes on Volcano Watch, updated every half hour, with photos. Still deciding on a destination? World Climate will give you basic information by city name. Weatherbase claims weather records and averages from 16,439 cities worldwide. And before you take off, check the Global Incident Map, which tracks global acts of terrorism and other suspicious events. Finally, for gorgeous satellite photography from all over the planet, see NOAA's Ocean Explorer Galleries, and it's hard to beat NASA's Earth Observatory and its photography archives. Alltop, the best of the best, has added Common Sense and Whiskey to a handy compendium of travel websites. Visit travel.alltop.com for a huge range of travel stories from all the best known travel blogs, including CS&W, updated constantly and clickable by headline. Aloha and thanks to Alltop. Tomorrow ought to be a busy day at Yapta.com, after a weekend story in the New York Times. Yapta ("Your Amazing Personal Travel Assistant") introduces a new feature tomorrow, which, if it works, could be a gold mine. The idea is, you track a flight you're interested in on their web site, and, according to the article, Yapta will send you an email alert when a frequent flyer seat opens up on that flight. Web Photo Search - A Nice Idea, Still in the Future. A nice idea - upload an image from your computer and find where it resides around the web. TinEye (free registration required) is on it. It's just that, for me, it didn't work. TinEye is still in beta, though. Our search index is still very small—just a fraction of all the images on the web! But our index is always growing, so be sure to search for this image again later. It must be a big job cataloging every photo on the web. We'll check back. With this Firefox add-on, experience web browsing as it's done in China. Everything works fine in Hong Kong, but as we reported about our last trip to China and as Tim Johnson affirms in China Rises, just the briefest trip to the mainland outside Hong Kong can cause your web browser to blink uncomprehendingly when you ask for, say, the BBC. Now you can try it for yourself from home. Get the China Channel Firefox Add-on. 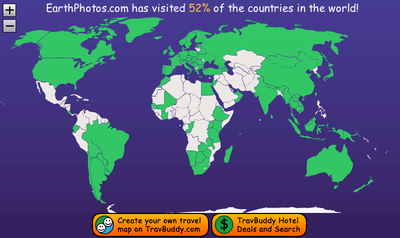 TravBuddy.com has a few travel widgets, including a tool that lets you map the countries you've visited. For EarthPhotos.com, our result is above. Domestic air travel may remain a universal whipping boy, but credit is due: All these international carriers were unfailingly courteous and helpful. Finnair lost a bag between Paris and Helsinki but recovered nicely with to-the-door delivery later the same day. Emirates' in flight magazine, Open Skies, was by far the best. It’s twice been voted the world's best by readers of Executive Travel Magazine. Ethiopian has a thing for hot towels. Every flight, no matter what. Usually twice. Oman Aviation gamely fit a meal service into a 45 minute segment. Perhaps it helped to fly business in one of Delta’s ten still shiny new 777’s, though. And in passing, Airfleets.net, where I learned Delta has ten 777’s, is a nifty tool. In a couple of weeks we'll be in Sweden, for all of two days. Transparent.com, purveyors of language software, has a nice, friendly blog about practical Swedish here. It's most current post is a helpful blueberry forecast for the rest of the summer. Scandinavia not on your immediate itinerary? There's also blogs about practical Spanish, Portuguese, Russian, Polish and Chinese.